The two-day event, which is held at East Kirkcarswell farm, near Dundrennan in Galloway, will also feature KT Tunstall, The Enemy, Dexys and 11-piece folk group Bellowhead. Organisers previously announced that Scottish rock bank Primal Scream will headline on the Friday, and Amy Macdonald is set to close the main stage the following day. The This Is The Life and Don't Tell Me That It's Over singer said: "I'm really looking forward to headlining the Wickerman festival this year as I love being able to play in Scotland and I have heard the Wickerman audience are a great crowd to play for. "There is always a great atmosphere so I am looking forward to a great evening together." Wickerman Festival co-ordinator Helen Chalmers said: "Wickerman prides itself on offering festival goers a truly diverse line-up, so it is fantastic to announce acts that cross so many different genres of music. "With Amy Macdonald, The Enemy and KT Tunstall joining already announced Primal Scream, we are confident that this year's festival will be the ultimate summer party and we are looking forward to announcing further exciting line-up additions over the coming months." 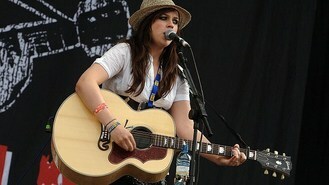 Tickets for the festival, which takes place on July 26 and 27, are available at www.thewickermanfestival.co.uk.